METAL PULP AND PAPER: Hello LaRissa. So glad to be catching up with you. Thank you for taking the time to speak with us at Metal Pulp And Paper. We appreciate it. How are you? How is your summer going so far? LARISSA VIENNA: I'm doing well, thank you! This Summer has been great. We got to kick it off with a tour, we released a music video and an album- I've never felt more fulfilled and happy, to be honest. MPAP: You’ve got some huge news to talk about. Your new release, Neptune VII just came out (September 1st) What can you tell us about it? 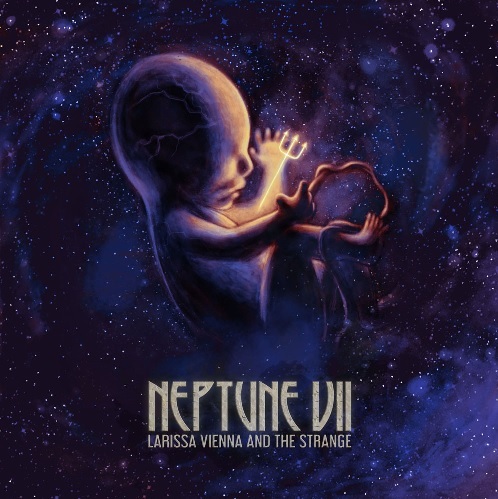 LARISSA: Neptune VII is my pride and joy. It's our first full-length album. It took me months to write, because I wrote multiple versions of each song until I landed on what I felt was right. Each song, to me, is very significant. I really wore my heart on my sleeve. It's very raw, and each of us pushed ourselves as musicians in the recording studio. MPAP: We’ll come back to Neptune VII momentarily, but first let’s get to know more about you and your band, The Strange? Who are your partners in crime and what do they do? LARISSA: The Strange is my guitarist Nick Workman, my bassist Aaron Mendoza, my violinist Vanity Welch, and my drummer Luke Wolff. MPAP: What made you decide to hang up being the solo act and have The Strange be a part of your musical career? LARISSA: While I was a solo artist, I'd have live musicians playing with me on stage to create that full band atmosphere. Once I found a really good team, I realized that we had something really special. I sat them down and asked if they'd like to be a band, and they were all in. I've had the same lineup ever since. MPAP: How did you find out about them? Were they friends of yours, or just musicians that came from off the street or from another band? LARISSA: Nick, my guitarist, is my best friend and has been playing with me for eight years. My bassist Aaron used to be in a different band that used to play shows with me and I scooped him up once that project ended. Luke and Vanity were fans - they used to just be in the audience, and they were the missing puzzle pieces that we needed. 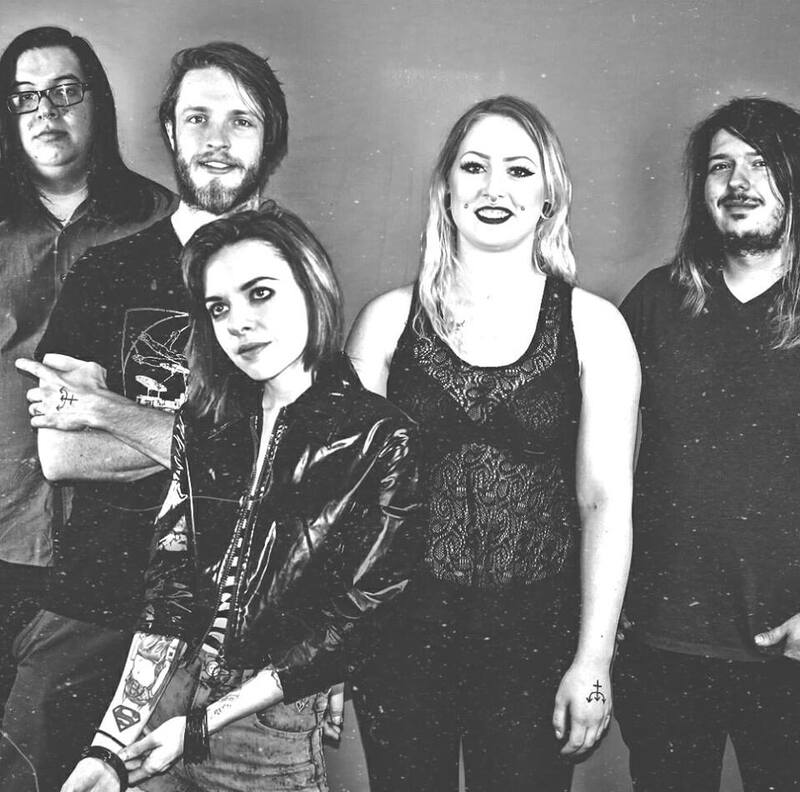 MPAP: It’s said that LaRissa Vienna And The Strange are a violin-driven rock band from Denver, Colorado. For someone new, what can they expect when hearing your music for the first time? LARISSA: Our music has lots of different elements. It's dark and moody, but other times it's uplifting and powerful. It's raw and emotional. When people hear it for the first time, I hope they genuinely feel something. MPAP: You started out as a solo artist in 2008? What got you into playing music? What had inspired you to want to start singing and at what age did you start? LARISSA: Yes, my first show was in 2008. It was really embarrassing, just me and an electronic track, with my friend pretending to play the keyboard. I started singing when I was able to talk, and I started performing when I was about seven years old. I always loved singing and dancing, I really wanted to be Shirley Temple. As I've grown older, she's still been my biggest influence, but of course my goals and intentions changed, but my love for performing never left. MPAP: You’ve been influenced by David Bowie to Marilyn Manson? Two ends of the musical spectrum. How has their music influenced you? LARISSA: I love artists who define a genre, or who even define an entire era. I adore controversial musicians who make people think. Bowie came out of nowhere, shocked the world with his look, and stayed relevant forever because of his talent. I love his music. I love Marilyn Manson for all the same reasons. I remember growing up and all of our parents were so afraid of him, but as I grew older, listened to his music and read his memoir, I saw that he's very smart and is actually spreading a really good message whether he intends to or not. He gives people permission to be themselves and to not care what people think. MPAP: Now back to your Neptune VII release. Some of the songs on it are "Same Devil, Different Ways", "Craving Chaos", and the "Haunted", which you also released as your first single back in July. What are some of these songs about? LARISSA: I wrote "Same Devil, Different Ways" about the fans that I talk to who experience depression like I do. Whenever I get a chance to really sit and talk to someone, anyone at all, I find that we have at least one thing in common- we're all fighting our own inner demons. The lyrics are "We're facing the same devil different ways, it's strange and unkind." It's a statement how we're all really connected. We're going through different things, but it's all the same in the bigger picture. "Haunted" is simply a song about being haunted by your past, not being able to let someone go, and the guilt of wanting what you can't have. I wrote "Craving Chaos" one night- I woke up at 2am, absolutely wide awake, and I couldn't go back to sleep until I wrote this song. It's about missing my old life, in a way. When I was a teenager, I was very wild, the people I hung out with were mischievous, and I always had some bizarre story to tell about my weekend. It's a song about growing older, and some pain that comes with it. MPAP: Is there a meaning or message behind Neptune VII that you’re wanting to get across to the listeners when they hear it? LARISSA: Absolutely. I realize that a lot of my songs have deep or sad undertones, but I wouldn't say I'm a sad person. I honor my darkness because I realize it's okay to feel this way, as long as you acknowledge it. Don't push your emotions under the rug. Let them out. The way you feel is valid. MPAP: "Haunted" is a very powerful rock song. Some might say it’s heavier, making it lean more towards being a Hard Rock song. Does it bother you a song like that, can almost put you in a different genre? LARISSA: I simply consider us a rock band. Even with our slower-tempo more easy-listening songs, the way we perform them live is crazy energetic and powerful. The nice thing is, I don't live in a genre. I make music simply by making things I like hearing. I use sounds I like, I write chord progressions that make me feel something. I can almost guarantee that I'll cross genres in people’s eyes, multiple times. I love change. "Haunted" just happened to call for a really hard-hitting sound. MPAP: What inspires you to write a song? Do you open the newspaper or magazine, scroll through the social media newsfeeds and go from there to get ideas? LARISSA: I pay attention to everything when I'm writing an album. Sometimes social media, but a lot of the time I'll delete social media apps from my phone for a while when I'm writing so I can shut the world out a bit. I read a lot of books. I've gotten inspired by poetry, I've written entire songs from a sentence I've said to somebody, sometimes I even hear a word that I like and I get ideas. Most importantly, I try not to overthink it. I let it come, inspiration happens everywhere. MPAP: Is the music written first, and then the lyrics, or vice versa? LARISSA: I make the instrumental first, then I write the melody, then lyrics. I'm always writing lyrics in a notebook, so once I have an instrumental, I can either start from scratch, or pull from something I wrote the other day. MPAP: How do you decide if the song should be dark and somber like "Underwater" or heavy like the previous song mentioned, "Haunted"? LARISSA: I like diversity, so I make sure that all of our material doesn't sound like one long song. But some subject matter calls for different moods in a song. "Underwater" was a song about relapsing, it really called for that slow, lullaby-like longing. "Haunted" was an angsty song and called for that hard-hitting riff and drum beat. I love the whole spectrum of rock music, I like to cover multiple areas of it. MPAP: This album took longer than you planned to write. You said you had almost a dozen versions of every song before they were final. Why was that? Did you feel they just weren’t good enough for your fans to hear? LARISSA: My mind was constantly running while writing this album. I had so many ideas to get out, and I wanted to execute them in the way that I was proud of. I'd finish writing a song, then I'd meditate on it for a couple days, then I'd go back and make adjustments. I must have driven my bandmates crazy, but it was a lot of trial and error, and now I know what I like and don't like. I had a lot of pressure on me from our previous release, because people loved it so much. I constantly want to be better than I was before. My only competition, in my mind, is who I was yesterday. So yes, I wanted these songs to be good enough and I'm really proud of the result. MPAP: How do you feel you’ve grown as a musician since your first release with The Strange, Make The Pain Pretty (2016)? LARISSA: It's like night and day, in my opinion. I got better at writing simply by doing it, a lot. I used to be a little lazy in my songwriting, I'd stick to a formula, I'd only use certain parts of my vocal range back when I was writing our previous material. For Neptune VII, I really pushed myself because I want to be constantly growing and improving. I suppose, in short, I learned how to be more brave and confident. MPAP: All good things must come to an end, but before we bring this interview to an end just a couple more questions. LaRissa Vienna And The Strange intend to inspire, influence fans to be creative and express themselves by leading by example. How do you do that when so much hatred is going on in the world these days? LARISSA: When I play a show, and I'm in the room with a few hundred people, the atmosphere is so loving and inspiring. It's as if, for that short time, all that hatred in the world doesn't exist. That's the cool thing about performing. If you put your heart into it, you can almost create your own world that people can step inside of for a second. I like to show people that that feeling of love, creativity, and passion still exists. The show isn't just for me, it's for them. MPAP: Do you have any bucket lists for the band? Places to play, musicians to maybe collaborate with someday? LARISSA: I've wanted to play the Pepsi Center in Denver since I was a child. I've seen all my favorite musicians there, it's a huge amphitheater. Every time I see a show there, I look at the audience and start bawling. I want to be on that stage someday. As far as musicians to collaborate with, I'm really sad I never got to meet Bowie or work with him. Other than that, I'd love to collaborate with Dave Grohl, or even just open for Foo Fighters. I'd die of happiness to write a song with Lady Gaga, although I can't imagine anyone I'm more intimidated by than that woman. She's incredible. MPAP: On behalf of myself and Metal Pulp And Paper, thank you, LaRissa, for doing this interview. Look forward to what you and The Strange do to finish out the year 2017 and beyond. Any last words you’d like to say to the readers and all your fans out there? LARISSA: I love you all so much! Thank you for listening to our music, sharing our music videos all over the internet, and thank you for coming to our shows and allowing us to do this. You all matter to me more than anything.